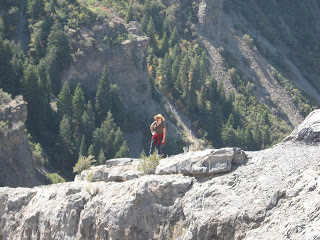 This week some of my friends invited me to come on a hike with them. I haven't hiked in years, so I guess I really didn't know what to expect. They also didn't really explain much about where we were going or what it was like. 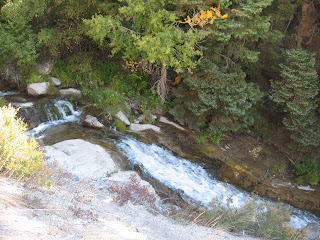 Anyway, we went to Pleasant Grove and a trail head called Grove Creek Canyon. It was pretty much uphill the entire 2 1/2 miles to where we stopped by a stream. It was really pretty and there were waterfalls from the stream. 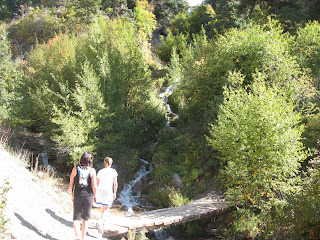 Going down was quicker, but we kept slipping on the rocks. I was so sore Friday, Saturday, and Sunday. It was really hard hiking up, but was also a lot of fun and I'm glad I went. This is where we stopped and rested. We just sat on the bridge and ate our snacks. One of my friends even got all the way in the water, as there was a small pool just south of the bridge. 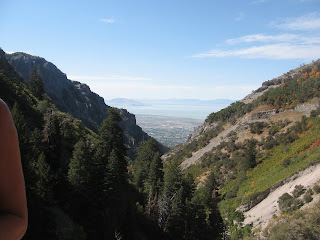 These are views of Utah County from inside the canyon. 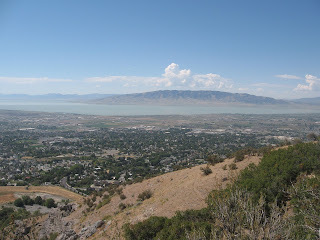 You can see Utah Lake in the second pic.